The story of how Jesse Giddings got his break in the entertainment industry reads like the opening act of a Hollywood film: star-hopeful moves from the suburbs to the big city with nothing but a duffel bag and a dream. We caught up with Giddings to find out what motivates him, and what he would say to his high-school self. Star Power: A six pack of questions for celebs making a difference. Craig and Marc Kielburger, founders of Free The Children and Me to We, check in with some of their favourite actors, singers and activists to find out how they are changing the world. The story of how Jesse Giddings got his break in the entertainment industry reads like the opening act of a Hollywood film: star-hopeful moves from the suburbs to the big city with nothing but a duffel bag and a dream. The multi-talented musician, model, and TV show host from Langley, B.C. arrived in Toronto a few years ago with a plan to take MuchMusic by storm. His plan worked. Giddings beat out thousands of hopefuls to land his VJ slot on the nation's TV music station in 2009, and soon became host of its flagship program, New.Music.Live. He stayed on at Much until 2012, during which time he covered the Olympics and the Juno Awards, co-hosted the MuchMusic Video Awards alongside Selena Gomez, and conducted dozens of interviews. Behind the scenes, he's been working on his debut EP, Brighter. Giddings, 28, is about to start the next stage of his career. Earlier this month, it was announced that he will join the E! News team as an on-air correspondent, where he will cover pop-culture from Hollywood, the world capital of celebrity gossip. Giddings is also a long-time ambassador for Free The Children, and remains very involved, despite his hectic schedule. He's travelled to rural Kenya to help build a school in a developing community, and designed the "Freedom" T-shirt for Me to We Style, with proceeds supporting Free The Children. 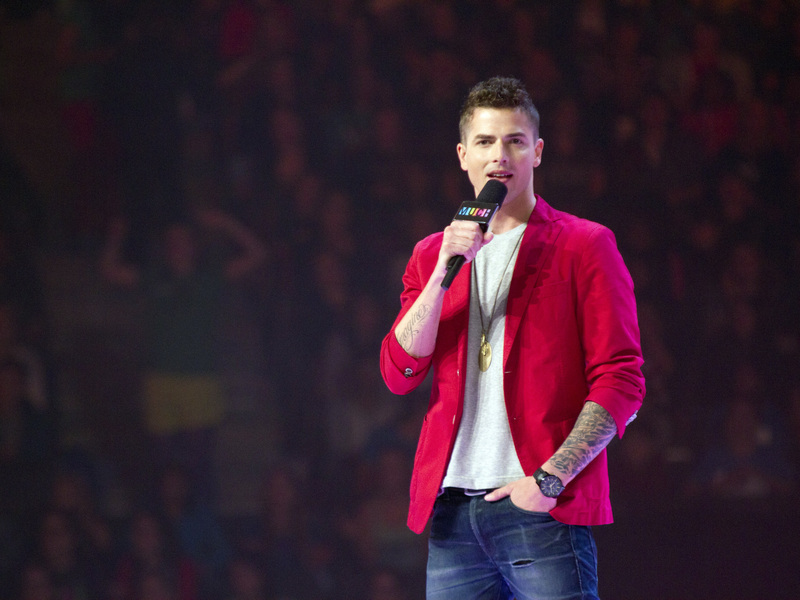 Most of all, he's a dedicated We Day champion, having hosted 15 We Day events across Canada in the past three years. We caught up with Giddings to find out what motivates him, and what he would say to his high-school self. Is there a moment when you decided to give back? It happened when I was 15. Up until that point I was pretty selfish; I was consumed with being popular in school, concerned with looks, fashion, girls and sports. And my parents sent me on a trip to Mexico to a small village nestled on the border, where the people had nothing. I met other kids my age, and it really drove home that we really are blessed and we have been given so much here. I realized then that I had been so consumed with what I want, and hadn't thought about what I could give. My mom is my hero. I say that, of course, because she's my mom and she's awesome. But also because she set an example for me of what it means to be involved in the community, and involved in social change. My mom has been involved in volunteering for as long as I can remember. She's worked with refugees who are new to Canada, helping them get acclimatized to their new culture. I saw that from a very early age and understood that it was more important to give than to get. What social issue matters most to you? Bullying is so prominent now and is something everyone has faced. I experienced it in high school and I'm still seeing it now. For three years working at MuchMusic I'd see hundreds of kids coming through our studios and many would tell me their stories. I would hear of their struggles and how they were just looking for hope and for someone to believe in them, to tell them that it will be okay. Bullying is a tough subject. A lot of people want to talk about it but not a lot of people want to do anything about it. Some teens will say, "Yeah, I have experienced bullying" but for some reason it's not stopping, particularly online. People live behind their user names, say whatever they want and are not held responsible. We need to team up together and decide once and for all that we're not going to tear each other apart. If you could have a socially conscious superpower, what would it be? The ability to eradicate negative thoughts. I believe that we are all our own worst enemies. The reason we don't pursue our dreams is because we are so hard on ourselves. I wish I could reverse our negative thought process so that people no longer look critically at themselves and at others. That would change the world -- if more young people began thinking more positively and were allowed to speak those positive thoughts. If you could go back in time, what would you tell your high-school self? I would have slapped myself a few times. I realized later that all my concerns during that time faded away when high school ended. I'd tell myself to spend more time loving people, looking around to find and help those people who were rejected. Now is your chance to make a difference in people's lives that's going to set them on a trajectory for years to come. Forget about trying to be loved by the popular crowd. I've had an obsession with legacy from an early age. I'd think, after I die, do I want to be remembered by my family, or by a city, or a country, or the world? People are mourned by the world because of their love for others. They left a legacy of love, and it lasted long after they passed. If all I ever did was love people - whether it's family, city or country - that's how I want to be remembered. Craig and Marc Kielburger are founders of international charity and educational partner, Free The Children. Its youth empowerment event, We Day, is in 11 cities across North America this year, inspiring more than 160,000 attendees from over 4,000 schools. For more information, visit www.weday.com.